Nitrous Express Fuel Pump - Lightning Motorsports - Selling Speed since 1996 ! The Nitrous Express SAFE (Stand Alone Fuel Enrichment) tank improves the performance of any nitrous system. The SAFE system includes a one gallon, high strength, composite fuel cell that can be mounted in most factory battery trays without modification. This version of the SAFE System is a great choice for those wanting to use their own external fuel pump and regulator. This high output in-line fuel pump flows like a race pump but is durable enough to run for extended periods on the street. High quality internal components ensure long life, low vibration, quiet operation and low amp draw. Includes stainless mounting brackets. This pump will support up to 900 hp at 5 psi and up to 700 hp at 45 psi. Must be used with a bypass style regulator. This is the standard fuel pump we include in all our wet kits. Draws a maximum of 2 amps. Solid state electronics, works with gasoline or methanol. 6 psi 35 GPH. Good for up to at least 150 hp. 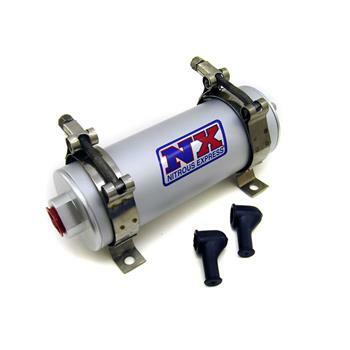 This package includes a NX Black style fuel pump. The fuel pump will support up to 600 HP on Gasoline. This is a great choice for carbureted applications as well as dedicated nitrous fuel systems.